The multi-use Horizontal Chin-Up Station provides a variety of exercises that welcomes all ages and skill levels. In combination with the included Plyometric Box, the apparatus offers assistance allowing the user to maintain balance of control over the amount of body weight they are lifting. Popular for use as a stand-alone element along fitness trails, the Horizontal Chin-Up Station is great addition as a component of outdoor fitness area for well-rounded workouts. 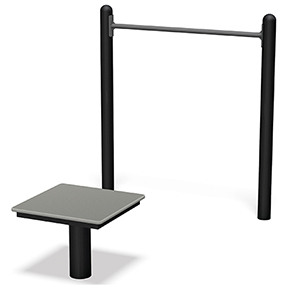 The Horizontal Chin-Up Station is engineered ready for outdoor use even with continued exposure to seasonal elements. Constructed entirely with commercial grade steel, the powder coated horizontal bar and textured HDPE plyometric box platform is an inviting addition to community spaces.